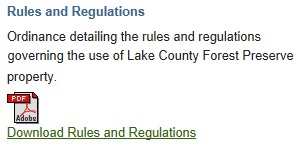 People wouldn't be allowed to smoke at any of the Lake County Forest Preserve District's nine playgrounds under a proposal before the forest board. The new rule would be enacted immediately if it is approved by commissioners when they meet Tuesday morning in Waukegan. Smoking at other forest district sites still would be allowed. Your LakeCountyEye presumes the smoking ban is intended to target not only the children but their parents as well. That seems only fair. for guidance. Did you know that yardsigns are not permitted on Forest Preserve land? Your LakeCountyEye did not know that! The informed sources have misinformed your LakeCountyEye that the Lake County Board (or certain members thereof) would prefer to run their County the same way that Mayor Michael Bloomberg runs his New York City. Bloomberg, operatives will recall, is notorious for banning cigarettes, trans-fats, styrofoam cups, 32-ounce sodas, etc., within New York city limits. Look for your LakeCountyEye, poundin' a coffin nail near you.